A big warmup is coming, New Jersey! Let the warmup begin! Well, almost. We are looking at significantly warmer temperatures in the forecast for the end of this week. However, 1.) we have to get there first, and 2.) there's evidence in the long-term forecast that above-normal temperatures won't last long. Monday morning is starting in the 20s and 30s. Definitely chilly. Especially when you consider that the normal low temperature for this time of year is around 40 degrees. Starting Monday evening, rain chances increase. The intensity of any precipitation will be light, and the spread will be fairly scattered. Furthermore, as temperatures dip into the 30s overnight, a few snowflakes are possible (especially north of Interstate 195). I could even see up to an inch of snow/ice accumulation on grassy surfaces in North Jersey only (north of Interstate 78). Even so, no significant accumulations or travel impacts are expected overnight. Showers may lingering through part of Tuesday morning, perhaps even through Noon. Clouds will continue to win the sky through the afternoon, with clearing to partial sunshine very late in the day. High temperatures will once again end up below seasonal norms, close to 50 degrees. Our first taste of nice weather this week will be Wednesday, as high temperatures reach the lower to mid 50s. (Still below normal though.) Skies will range from mostly to partly sunny, and we will have a fresh southwest breeze, up to about 20 mph. 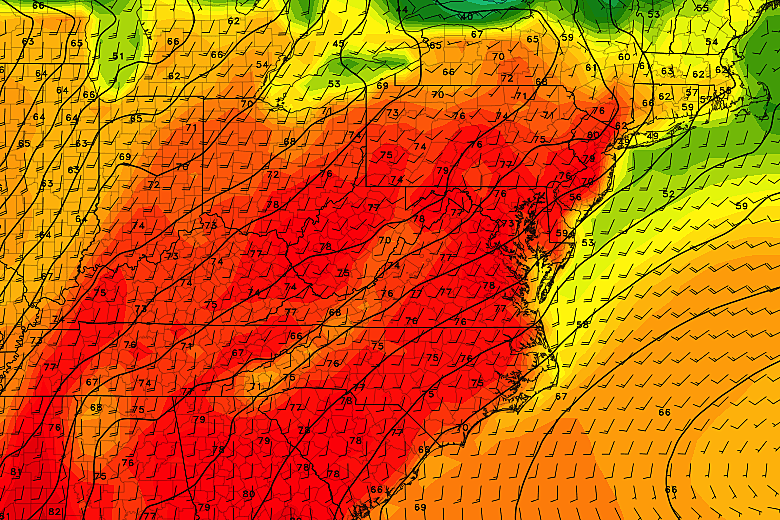 The promised big warmup arrives on Thursday. The day will be windy, with potential gusts to 40 mph from the south. And there could be a shower in North Jersey. But with widespread afternoon temperatures in the 60s, it will finally feel like Spring. 70 degrees is a possibility for interior South Jersey on Thursday. Friday gets even warmer. Under partly sunny skies, we should climb to about 70 degrees in North Jersey and along the coast. Mid to upper 70s for most of the state. And we may touch 80 degrees in inland South Jersey. Saturday's numbers look very similar — mostly 70s, maybe 80. The only difference will be a slightly stronger wind — I'll call it "breezy" up to 20 mph. We'll start out warm on Sunday, with lower 70s still possible. But an approaching storm system looks pretty powerful, and will likely bring an extended period of rain and thunderstorms sometime between Sunday afternoon and Monday morning. This one just looks wet — I don't see any wintry weather, even on the backside. Behind that storm system, we'll certainly get some sort of cooldown. But whether thermometers dip to seasonable 60 degrees or chilly 40s? Not sure yet.